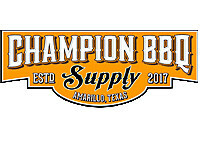 We are Amarillo’s one and only BBQ Supply Store. We carry many Grill and Smoker manufacturers, Blaze, Big Green Egg, TEC, Backwoods smokers, Pitts and Spitts, The Good One to name a few. We have the Panhandles largest selection of competition spices and sauces! We are focused on helping people cook better and have testers so both the competition teams and the backyard cooks can perfect their recipes. We have enjoyed partnering with charities to raise funds and raise awareness through competition cooking and local cook-offs. We are teaming up with Champion BBQ Supply and Edes Custom Meats to make sure you have the best tailgate set up at the game. Enter here to win a awesome tailgate package. IT'S A CHARCOAL GRILL AND A SMOKER. PKs unique capsule shape and 4 vents make it easy to grill hot and fast or low and slow. THICK CAST ALUMINUM CONSTRUCTION. Aluminum is rust-proof, durable, lightweight and conducts heat 4x more efficiently than steel charcoal grills. IT'S PORTABLE! The Original PK Grill & Smoker detaches easily from any of it's available stand options for transport. As a portable smoker grill, PK's are great for tailgating, camping, fishing/hunting cabins, etc. Don't run out of meat at your tailgates. Stock up with this Edes Custom Meats gift card.